We have reason to believe that our best advertisement is by word of mouth from our current parents or our parents that have moved on to the school system. Since you, our parents are our best advocates we hope you will appreciate us reminding you of a few of the points you may want to pass on to those word of mouth recipients. We are a not for profit organization. This means all the proceeds that come in the door, stay in the program. It also means we can fully access government grants which help keep the fees to parents reasonable. There is consistency in staffing with very little turnover in staff. The program and curriculum is planned for all ages. This gives the children the best and the most we can give, everyday. We guarantee the quality of our program. There is no fee for unlimited vacation days with two weeks’ prior notice. We give unlimited TLC to all ages and tax receipts! If, through your advocacy on our behalf, your friends or family enroll their children, please let us know. We will give you a Chapters gift card to enjoy with your child. Welcome to our Early Education & Child Care Program. We are glad you are allowing us to be a part of your child’s early years. We are anticipating it will be an enriching and positive experience. This is general information about our programs, policies and procedures, which we feel would be helpful for you to be aware of. You are welcome to visit our programs, but we would like to be advised so your visit does not conflict with other visitors. We want you to feel welcome and comfortable. If you have further questions please feel free to discuss them with the Director and/or Supervisor. Regular routines are important to young children. We recommend that parents set up regular hours to pick up and drop off their child(ren). We would remind parents that the school’s closing time is 6:00 p.m. If you are unable to pick up your child by that time, please make other arrangements for someone else to do so. Just call and let us know. Reminder, a late fee is charged. If you are late three (3) times, this will result in termination. 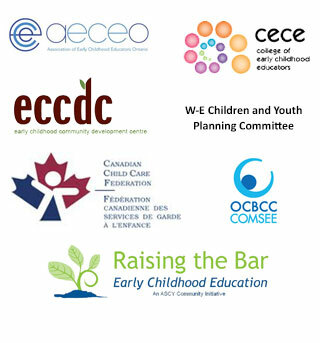 The Child Care Early Years Act states that children must be signed in and out by the parent each day. Upon registration, you will be asked to list any persons other than yourself that will be permitted to pick up your child. Unless otherwise arranged, children will only be released to persons specified on the registration forms. If your child(ren) do not attend every day, we prefer set days. i.e. Mon., Wed., Fri., attendance. If some other arrangement is required, advanced notice of scheduling is necessary. For safety reasons, we encourage only parents, teachers, adults, etc., to open the doors to the school. If the child were to open the door at any other time during the day, the consequences could be very serious for your child or possibly someone else’s child. We would therefore appreciate it if the children do not open the doors at any time. Our Kindergarten and School Age children at the Essex Public School Site do participate in activities in the community. These activities usually occur only during non-school days. The children are well supervised for these activites off premise. Activities might include trips to the library, a visit to a local park, etc. Parents are notified verbally or in writing when these activities occur. During the winter months, we expect to be open during inclement weather. We do not usually close. If you have any doubts about our Centre being open, please call us. We are closed for all statutory holidays and closed between Christmas and New Year’s. We are also closed two additional days, which are Easter Monday and the Civic holiday in August. We are a peanut/nut free school. Please keep this in mind if you send a treat to school for some reason, i.e. birthday. Also, if your child has peanut butter for breakfast, please make sure his/her hands and face are washed thoroughly and their teeth are brushed before coming to school. Sunscreen will be provided by Story Book Early Learning Centre. The brand name is Croc Bloc. It is a paba free and hypo-allergenic with an SPF of 30. Sunscreen will be applied to all exposed skin, including face, tops of ears, arms, legs and bare shoulders. It will be effective from 10:00am to 4:00pm. If you do not want us to apply our sunscreen to your child, please notify staff and apply your sunscreen at home before your child arrives at school. Abuse, neglect or allegation of abuse or neglect must be reported. A life-threatening injury or illness. An incident where a child goes missing or is temporarily unsupervised. Unplanned disruption of the normal operations that poses a risk to health, safety and well-being of children receiving care. Day to day minor bumps or accidents are not considered a serious occurrence. We do have students working placements from time to time from St. Clair College and Essex District High School. Students do not have unsupervised access to our children. Children with exceptionalities are included in our program. They are supported by a Resource consultant from Children First and provided with programming to meet their individual needs. Please pay all fees in advance on the first day of the month that your child attends school or half fee payment on the first of the month with the balance of the fees on a post-dated cheque for the 15th of the month. Two (2) weeks notice is expected for vacation or withdrawal from the program. Small problems with behaviour management during the day are not a big issue for us. We do not want to ‘tattle’ on the children unnecessarily to the parents. However, if there were a significant problem, we would inform you. Behaviour management is an ongoing process, not something that takes place only during certain times or activities. The environment and the daily schedule are set up to help reduce problems. Planning ahead is an important tool we use. We like to encourage ‘appropriate behaviours’. A staff member (supervisor or designate) will administer medicine to your child only when necessary. Story Book Early Learning Centre will administer medication in the best interest of the child and so that the child can return to school. It would be preferred that any medications brought to the school, be prescribed by a physician. Medication must be in the original container with a current date, the child’s name, time, dosage and instructions for administering and storage. A parent must complete and sign the school’s medication form in order for the medication to be administered. Supervisor, or supervisor’s designate administering the medicine will also sign the completed medication form at the time of administration. Over the counter medicine requires the same information as above along with a completed medication form in order for the medication to be administered. We realize it is inconvenient when a child is sick, however, it is not possible for sick days to be made up on another day. If your child becomes sick at school, we will contact you immediately. In consideration of all the children in our school, we know you understand it will be necessary for you to pick up your child or make arrangements for someone else to pick up your child as soon as possible. Not passing the “bugs” around is very important to us. Please make sure you inform us of any phone number changes and that we also have current alternate phone numbers to call if we are unable to contact you. If your child is sick for an extended period of time, there will be no fee after the first week until your child returns to school. Fever – Anytime the child has a fever of more than 100 degrees Fahrenheit the child will be sent home. The child may not return to school until the fever is normal for twenty-four (24) hours without having had Tylenol, Advil, etc. Diarrhea – A child that has had diarrhea occurring at school twice in one day for whatever reason will be sent home. The child may return to school when the problem has been resolved. When a child is sent home with diarrhea on two (2) consecutive days, the twenty-four (24) hour rule will be necessary to prevent infecting other children. Conjunctivitis – (Pink eye, eye infection) – The child may return to school when the child has a current prescription to treat the problem or a medical certificate stating the problem is under control. Impetigo – The child may return when the area is clean and dry. Ears Draining – The child may return when the drainage has ceased.